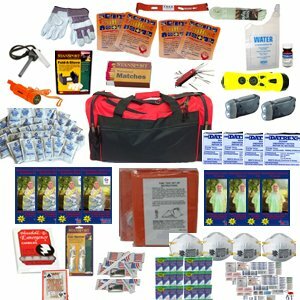 This survival kit gives you numerous essential goods to help you get through an emergency situation intact. It provides enough to last four people up to 72 hours in case of a hurricane, flood, earthquake, or other emergency. In these situations, your access to food supplies, communications and medical care could easily be severed. It is important to be prepared for the worst and ensure that you don’t find yourself unable to care for your family in the event of such a disaster. The kit includes food and water, the most essential things to have on hand in an emergency situation. The packaged food and water items in the kit have a shelf life of up to five years. You can also be sure that any additional water you acquire is safe to drink by using the included water purification tablets. This survival kit also gives you the ability to quickly construct a basic shelter with the included tent, rope, and sleeping bags. You also get items needed for navigation, basic first aid, safety, gas and water shutoff, and much more. Even things you would never have thought of are all included to make sure the kit is comprehensive enough to be truly useful in a survival situation. With this kit, you and up to three other people will be better suited to make it through any emergency situation that may arise. This four person survival grab and go kit has been well reviewed by previous customers on Amazon. The average rating given by buyers is an impressive four out of five stars. Several customers commented on the convenience of having a survival kit that comes all assembled for you instead of having to acquire all the individual pieces yourself. Other buyers remarked that the comprehensive nature of this kit makes it a great addition to any survival preparedness stockpile. If you are looking to secure yourself and your family from an unexpected lack of needed resources during an emergency, this survival kit is an excellent choice. « Is an airplane the perfect carrier for an infectious disease?